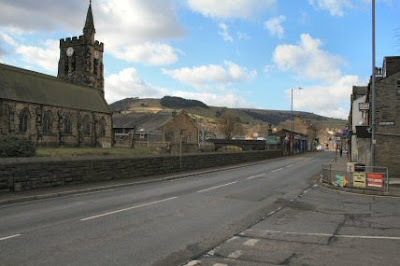 Mytholmroyd is the birthplace of the English poet Ted Hughes who was born on 17 August 1930 at 1 Aspinal Street. He became the Poet Laureate and married the American poet Sylvia Plath who is buried at nearby Heptonstall. Its population is roughly 4,200. Mytholmroyd Community Centre hosts the annual Dock Pudding Championships in April, attended in 2007 by Robbie Coltrane who entered the competition and came second. and the Mytholmroyd Gala takes place every July. During the late 18th century, the valley to the south, known as Cragg Vale was home to a gang of counterfeiters known as the Cragg Coiners. The gang's leader, David Hartley, or King David as he was known, was found guilty of the 1769 murder of excise official William Dighton and was hanged at Tyburn near York, on April 28 1770. Two other gang members were also executed for their part in the murder. There are a couple of pubs in Mytholmroyd. The Dusty Miller which is really a restaurant with a bar attached but you are made very welcome here. The Shoulder of Mutton is across the bridge and to the left. Here is a real old style pub and very enjoyable. Spent an age chatting to a delightful couple about the history of the village and it turned out that the husband was a descendant of one of the coiners of the 18th century. There is a display case with the history of the coiners and some samples of the coiners art. A new sculpture was unveiled yesterday by the Bishop of Wakefield. 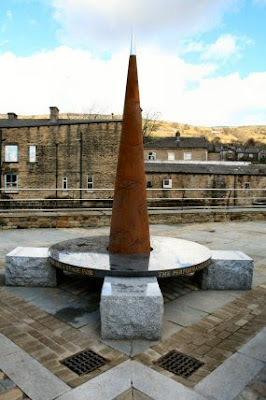 The cone is of iron and has slits in it which are lit up at night. Around the base are some words from a Ted Hughes poem. 'Moors are a stage for the performance of heaven'. The house that Ted Hughes was born and lived in is a terrace further up the hillside. Wandering around I found a sign to the clog works. 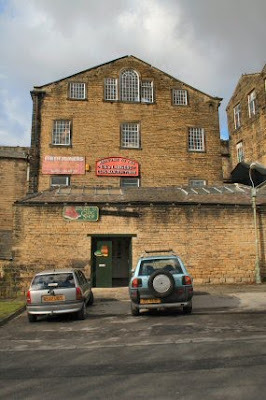 Just a couple of hundred yards from the canal is Walkley Clogs purported to be the largest maker of clogs there is. Inside are a number of shelves with the type of clogs you can buy and if there isn't the right one for you it can be hand-made to order and mailed on. 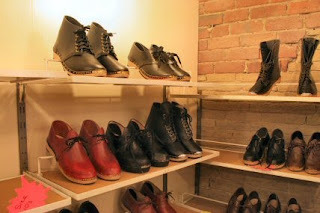 While in the shop you can look through into the works and watch the clogs being made. 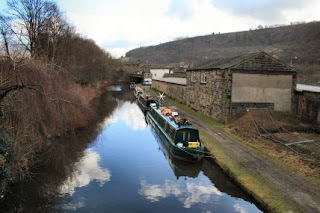 Back to the mooring and tomorrow it is the delights of Hebden Bridge for us.